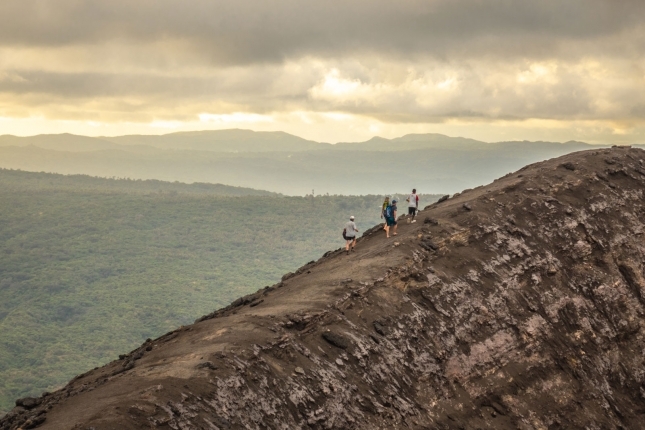 We were hiking the ridge of Mount Yasur on the island of Tanna, one of 83 outposts in the South Pacific that form the nation of Vanuatu. Yasur is one of the world’s few active volcanoes considered “safe” to view up close; we were still two hours from the top but already the mountain was making thunderous, frightening sounds. As we walked, I reflected on how we had gotten there. I had sailed the islands of Vanuatu in 2007 with my wife and young daughter. 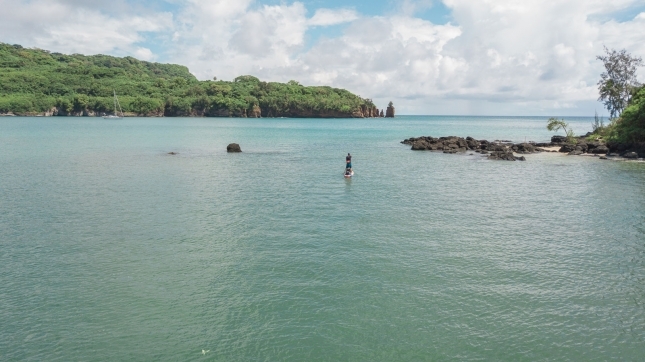 With fond memories of the people, their culture and nature, I’ve long since wanted to return and explore the archipelago on a stand up paddle board. Thanks to Starboard, we got that opportunity in March. And by “we” I mean myself and Starboard team mate Trevor Tunnington, an excited young explorer who needed no convincing to join the expedition. 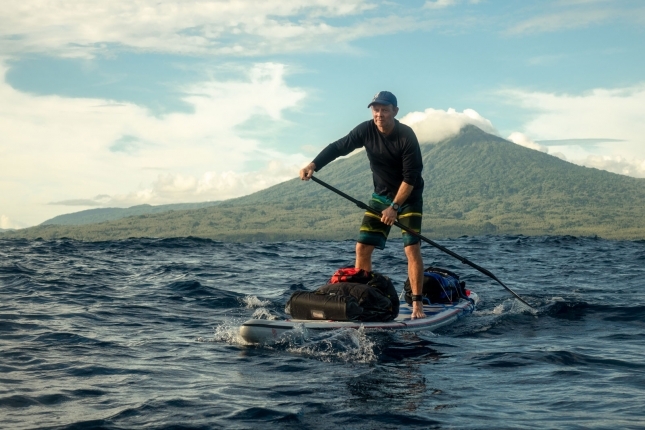 Trevor is a famous paddler in his own right, having won several big races around the world, yet he is a traveler at heart: “An expedition by SUP through one of the friendliest yet most naturally-dangerous nations on earth. What’s not to like about that? !” Trevor replied with his signature enthusiasm when I invited him to join. We traveled light, taking two Starboard inflatables (the 14 x 30 “Touring” and an 11’2 x 32 “iGO“), three-piece travel paddles, a tent, sleeping mat, basic navigation gear and an emergency ration of food and water. 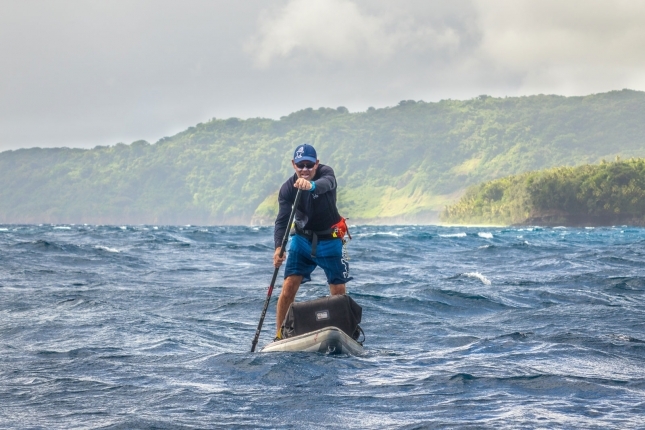 The Touring board is perfect as it paddles somewhat like a wider, more-stable race board, while the iGO has a double chamber that brings extra safety when doing ocean crossings (basically, if you get a puncture while out at sea the board should remain inflated enough to return to land). 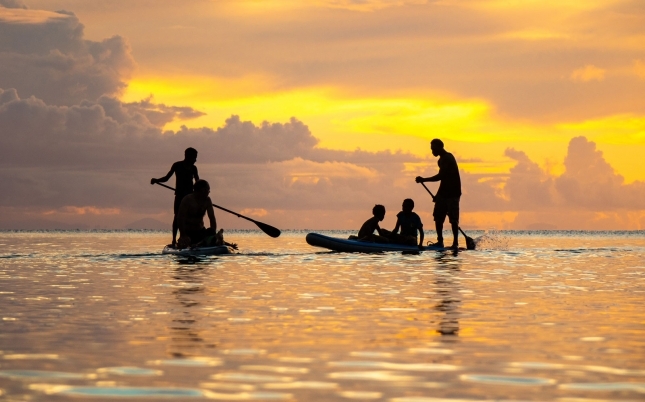 Vanuatu consists of 13 main islands and about 70 smaller ones; it’s an ideal place to paddle and explore via SUP. 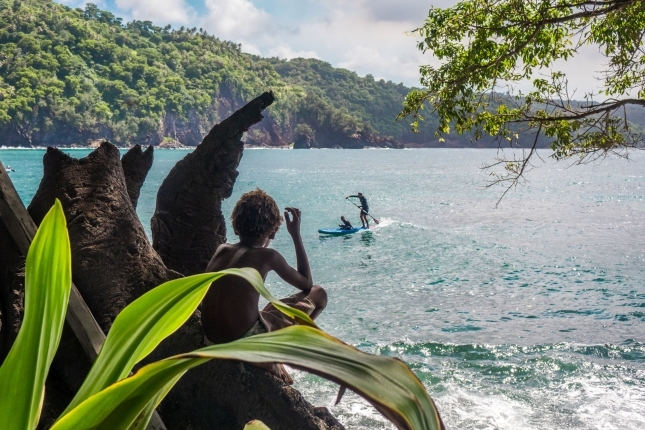 Apart from its capital of Port Vila, this country is the definition of remote. 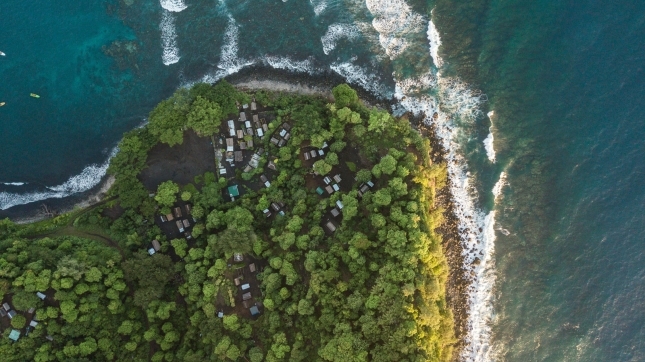 So remote that villages in the outer islands very rarely see visitors let alone tourists, while many don’t even use money. 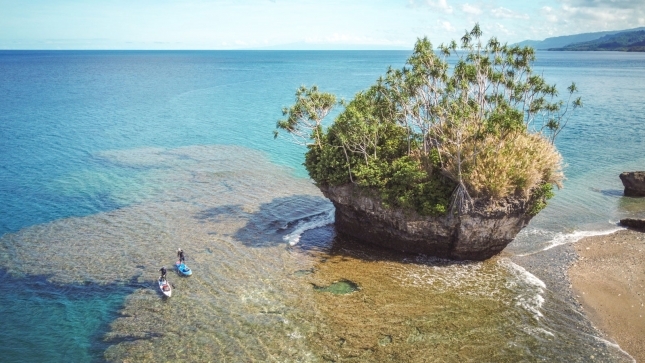 It’s apparently one of the least-visited countries in the world, which is both unsurprising given its location and completely baffling considering its natural beauty. 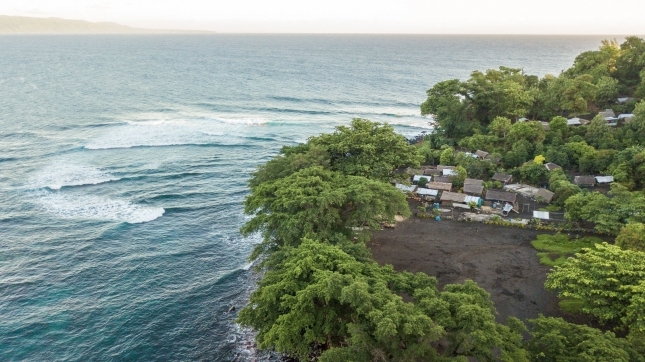 After a short flight on a tiny plane from the main island, where we had a bird’s eye view while looking over the shoulders of our pilots, we landed on Tanna where we found a 4×4 willing to drive us to the village at Port Resolution. The drive was two hours on a muddy road, and I use the word “road” generously. 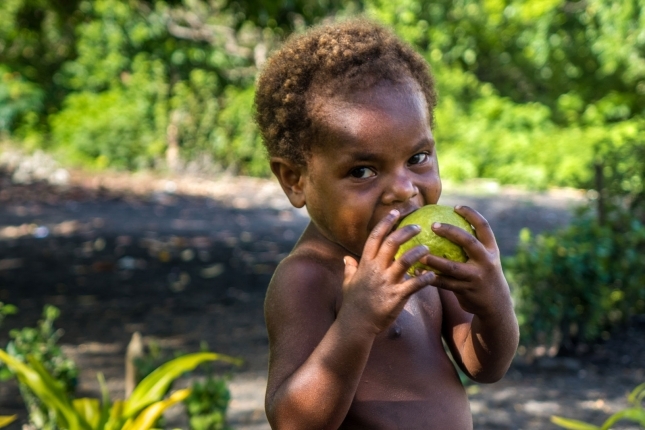 It is customary in Vanuatu to ask the village chief for permission to visit and stay. Normally you do this with a gift — we brought t-shirts, lycras and hats that seemed much appreciated. After we chatted to the leader, he gave us permission to stay and offered up a great camping spot right near a cliff overlooking the bay. Before we departed for our long hike to the volcano, we found a deserted white coral beach to cool off with a swim. 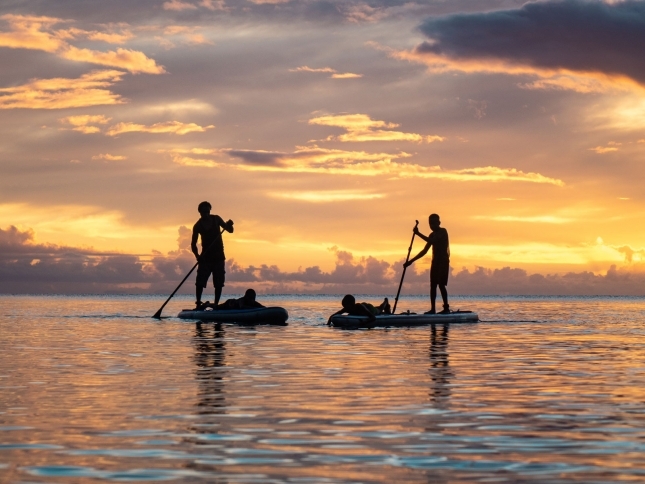 One of Starboard’s themes is “Live the ‘Tiki’ life,” and I suspect this was exactly the picture our marketing team had in mind when they came up with it. 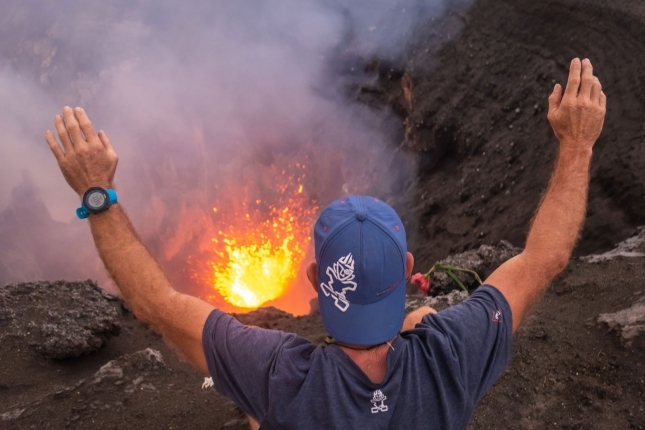 After hiking up the slopes of the mountain for hours, thunderous explosions getting louder and louder, we soon found ourselves in front of an immense lava cauldron. After a brief ceremony and some wise instructions not to go jumping over the edge, we headed to the rim of the crater for a closer look. We were standing there in awe when a sudden wave of pressure swept past us like a sonic boom, followed immediately by a massive explosion that threw giant chunks of lava hundreds of metres in the air (much higher than we were standing, though fortunately we were watching from a safe-enough distance). It was quite a shock. Many people in our group instinctively ducked or ran for cover. It was so awesome, thrilling and frightening all at the same time. We stayed on the rim until it got dark, with lava explosions illuminating the darkening sky every five minutes or so. The more the light diminished, the more incredible the spectacle became. After a few hours on top, we hiked back down and fortunately got a ride in a local 4×4, saving us a two and a half hour walk through the dark back to our host village. 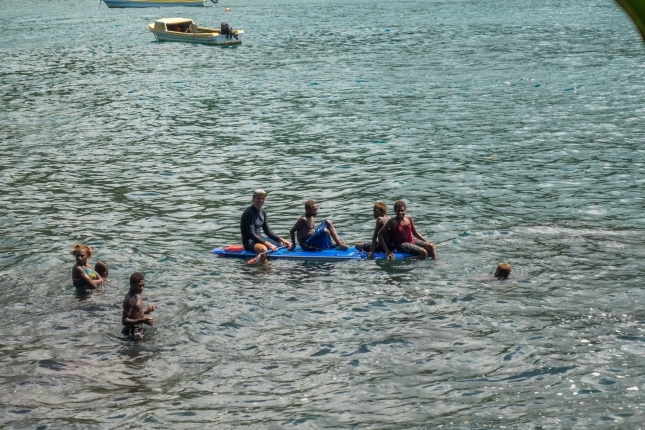 The next morning, we pumped up the inflatables and paddled a few hours over to the next village, Ipikel. Along the way we came across a scene straight out of BBC’s Blue Planet: sharks in a feeding frenzy. About half a dozen of them were hunting a school of tuna, and we’d stumbled right into the middle of it. A couple of the sharks acted as herders, compacting the tuna into a tight ball, while the others aggressively gorged on their feast. I got close enough to put the GoPro under water for a few seconds and record some video, hoping the camera didn’t look too much like a tuna head. 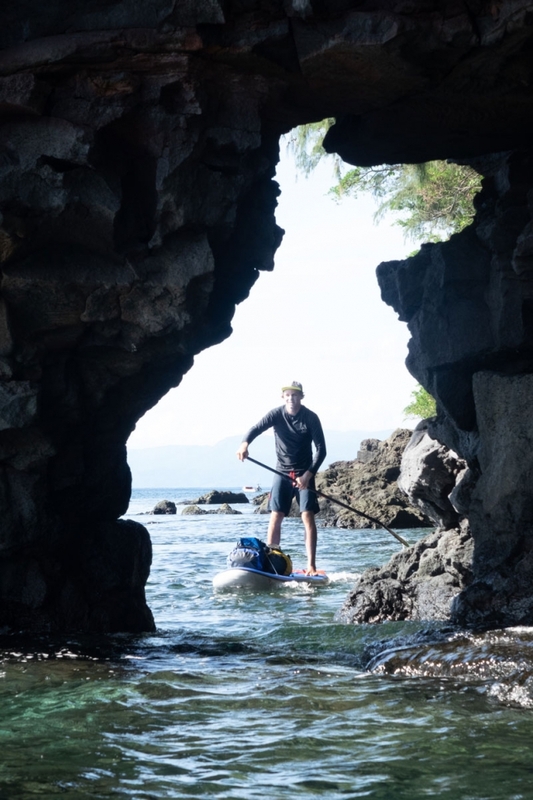 We continued our paddle along the coast to Ipikel, where we saw a local waving and guiding us to a safe landing spot through the beach break. It turned out to be William, the village chief, and soon a crowd was gathered as we pulled our boards and gear up the sand. I’m not sure who was more excited to see the other, us or them. 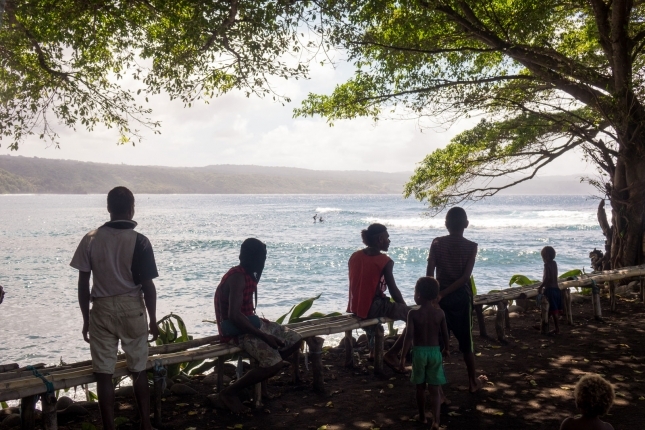 If there is one thing you take away from traveling through remote Vanuatu, it’s the way people in these small islands live. The contrast with the Western world couldn’t be more stark. Chief William and his adopted son, William junior, showed us around and explained their culture. They don’t use money in the village — everything they eat is grown on their land and the houses are made almost entirely from natural materials. If anything else is necessary, they will trade with another village. The people here have a lot of time for each other, and themselves. Nobody seems to be in a hurry or stressed; everyone is friendly, helpful and seemingly very content. It is a simple life, but to me it appears to be a very rewarding and happy one. That evening, we were invited to drink “kava” with some of the men in the village. It is a ceremony they do almost every night in a special part of the village that only men are allowed to enter. 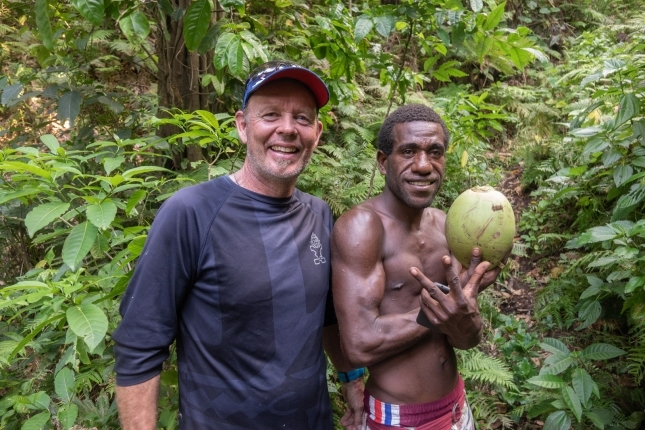 The recipe for kava is also special: The men will each take a mouthful of the kava root, chew on it for about 15 minutes and then, with a lot of noise, spit it out onto a leaf. 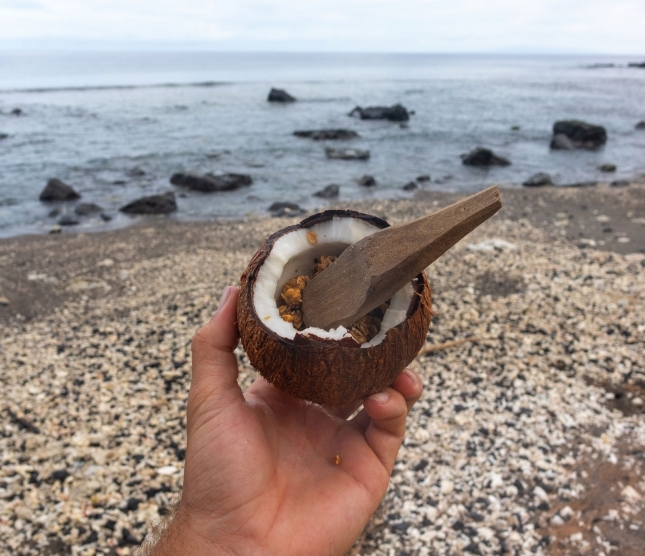 They gather all the mashed kava into a cloth, pour water over it and smush out the muddy concoction in a coconut shell. The result is a yellow, milky liquid that is highly sedative. I drank only a little but immediately my lips were numb. Trevor drank an entire bowl and seemed to enjoy the feeling. I didn’t enjoy it quite so much. The following day we were woken by pigs running around our tent, which we’d erected right in front of the chief’s hut. 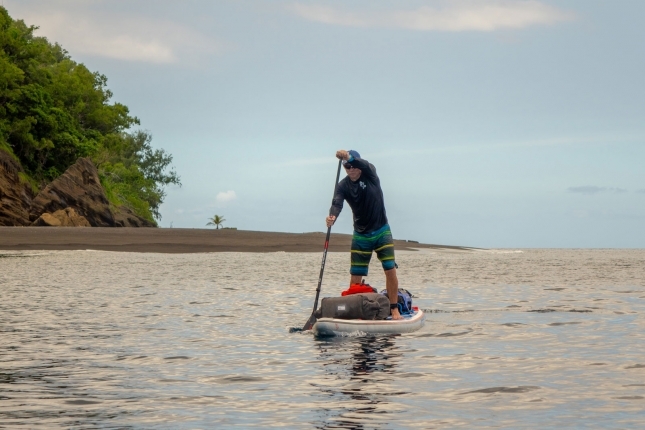 Following a breakfast of fried fish that William had caught just an hour earlier, we took off on our boards and enjoyed a great little downwinder to the village of Waisisi. Again it was a similar arrival scene: at first one villager looks bewildered, then curious, then the entire village comes down with the chief to greet you. The local leader, John, was very friendly and showed us another million-dollar camping spot. He told us that most of the bay was currently ‘tabu’ or forbidden for swimming or fishing. This is a ritual the chiefs hold every year to give fish time to lay their eggs and keep the islanders’ food source sustainable. 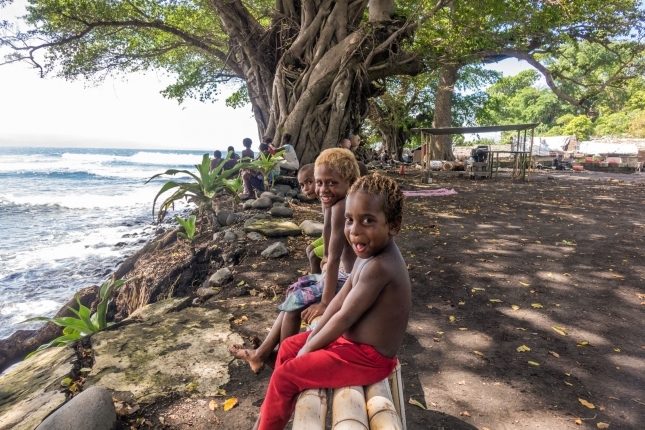 The chiefs of all the surrounding villages sit in a hut on the beach discussing the tabu all day for several days. 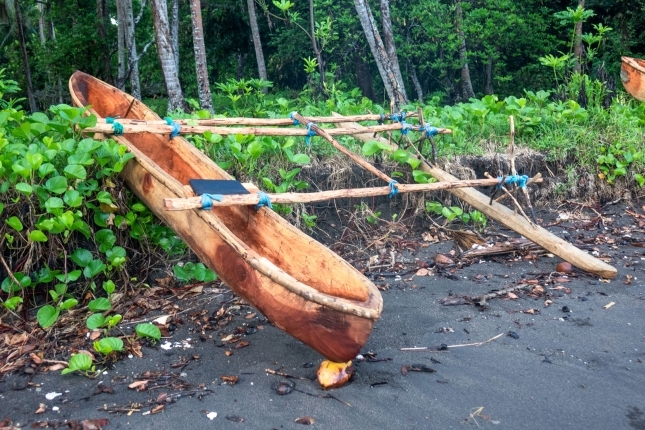 Nobody knows exactly when the tabu will end — some told us it’s usually a couple of weeks before the chiefs decide it’s over with a ceremony that marks the re-opening of fishing season. However, all of the kids, as well as us, were given permission to swim on the side of the bay where small waves were breaking on the reef. So we invited the children to join us paddling and playing on the inflatables, which turned out to be a highlight for them as well as us. The whole village went wild when one brave local tried to catch a wave only to fall spectacularly. Everyone was laughing, not out of mockery but from pure joy at witnessing what must have been a strange spectacle for them. In the afternoon, some of the kids asked us if we’d like to gather coconuts. 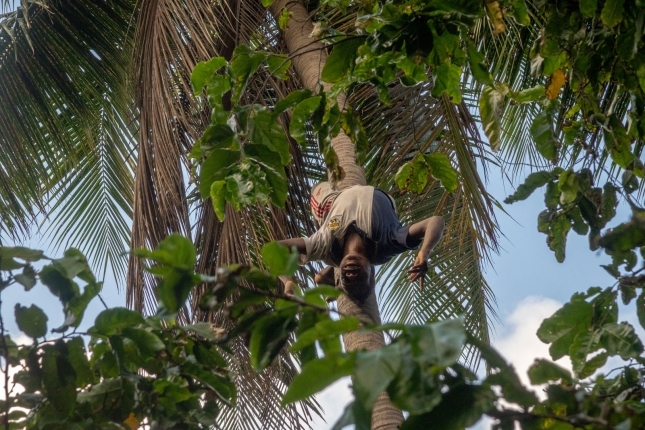 We walked up into the jungle and watched in awe as the youngsters climbed 50ft-tall palm trees, bare-footed, to fetch the fruits. Their skills are so impressive, and we found even more respect a couple of days later when we tried (and failed miserably) to do the same thing. The kids here walk to school every day. The trip is one and a half hours. Each way. But again, nobody seems to complain. Rather the opposite, in fact: they all seem genuinely happy. 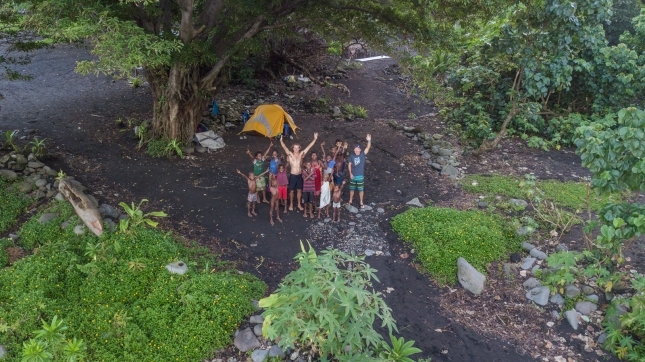 We finished our last night on Tanna by sharing a meal with the chief and his wife, seated on the ground, which is a local custom. For the second part of our trip we flew to the island of Ambrym. 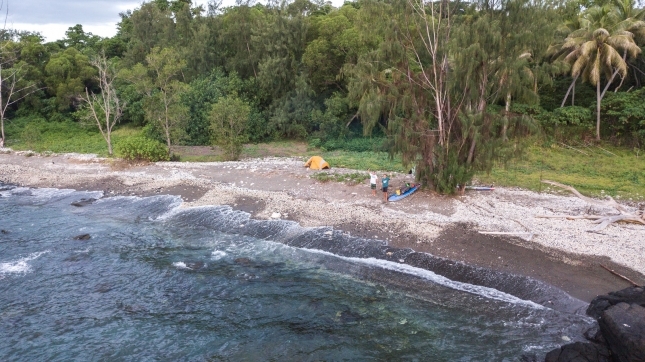 Our 12-passenger plane landed on a tiny grass airstrip before a short walk through the forest saw us arrive at a volcanic beach where we inflated the boards once again. 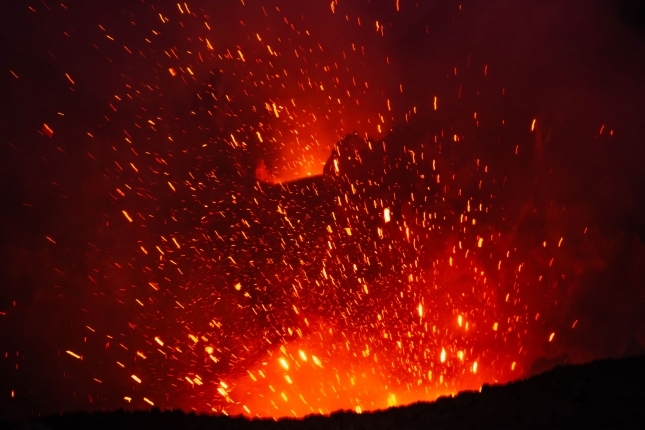 The volcano on Ambrym only recently stopped flowing after a decade of continuous activity. You can still hear it rumbling beneath the ground. 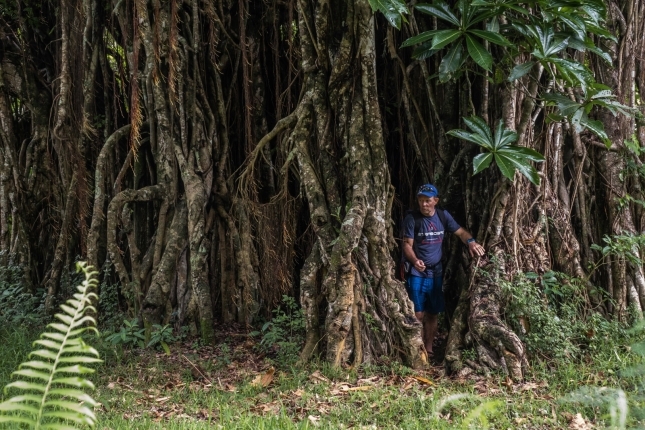 The island’s inhabitants endure frequent earthquakes, while just five years ago a category 5 cyclone destroyed virtually everything. Although some residents have rebuilt with concrete, most simply went into the forest and gathered wood to quickly rebuild their huts. I recently read that humanity is using 1.7 times what the earth is capable of restoring each year. But in Vanuatu, the people clearly don’t take more than nature can handle. There is also virtually zero waste and garbage because they are living almost entirely off the land. We never saw plastic or waste other than what washes up on the shore from their distant, plastic-consuming neighbours such as China or the Philippines. There in no traditional electricity, but we saw many huts with solar panels on the roof to power a single light in the evening. Water for drinking and cooking comes from the rivers. 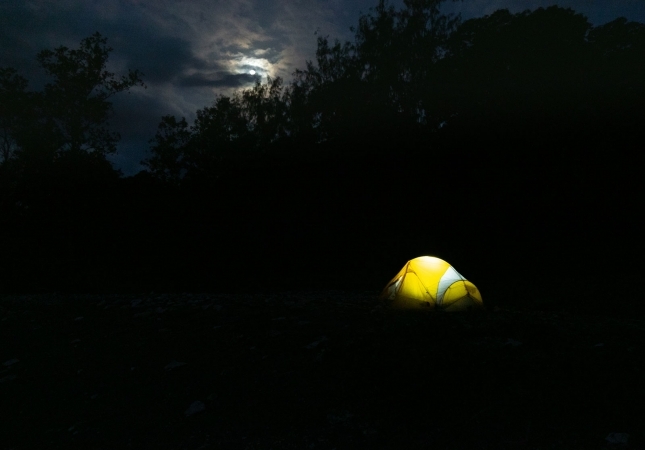 After spending a night on a deserted beach along the coast, we awoke to find our main water bag had sprung a leak and was now empty. We were suddenly out of water and hours away from our next rendezvous point. The temperatures and humidity in Vanuatu are high, and so was our water consumption. So after a couple of hours paddling, we made landfall where I suspected there was a small river after studying the maps. Unfortunately, the river was dry and we had to continue on to the nearest village. By the time we arrived, it would be an understatement to say we were thirsty. But everywhere we visited, people were genuinely friendly and willing to help. That is simply the nature of the people here. Though also, perhaps, they were worried about us traveling across the ocean on paddleboards. They had never seen SUP boards before, and most of them referred to our inflatables as kayaks. Dehydrated and near-delirious, an older woman sitting under a tree in the small village offered us water and bananas. We eagerly devoured the food and filled our stomachs with water. Life can be so simple. That evening, we camped near a village on the north-eastern point of Ambrym island after asking permission from the local chief. 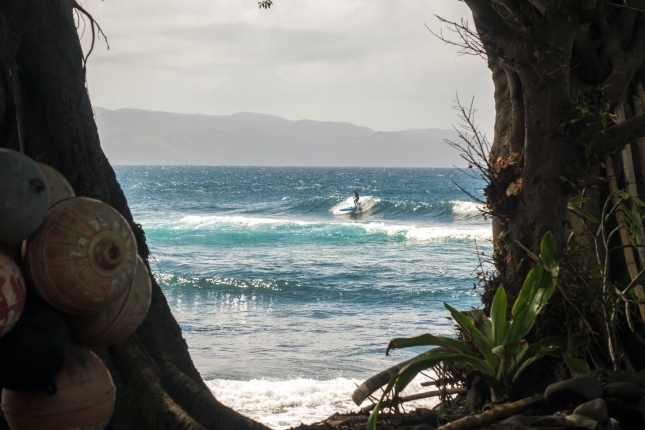 We collected some fruits for dinner and paddled with some local kids in the small, fun waves. 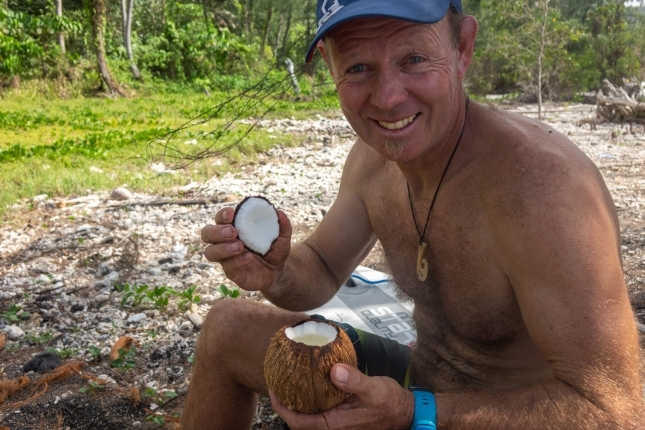 At one point, Trevor came racing back in to the beach convinced that he’d seen a crocodile, which do indeed roam the northern parts of Vanuatu and are extremely dangerous. Fortunately it turned out to be a harmless dugong. The following morning, we made the 10km crossing from Ambrym to the island of Pentecost, an island that has become somewhat famous for the ritual of wooden-vine bungee jumping. Every May and June, since as long as the locals can remember, young men get a chance to prove their bravery through this mesmerising feat known locally as “Gol” but referred to simply as land diving by Westerners. 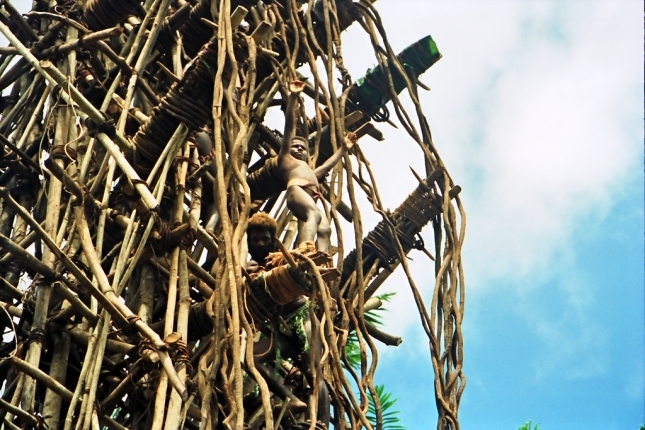 Young men from Pentecost island collect vines from the forest that act as rope, and they build a giant wooden tower from the trunks of small trees to serve as a platform. With the “ropes” tied around their ankles they jump, often from a great height, and hurl themselves towards the ground, sometimes landing a few feet above it, sometimes slamming into it with a painful thud. Occasionally the vine will snap completely. We didn’t get to see the locals in action, but the structure from last year was still standing and it was mighty impressive in height. We talked about this with one of the local villagers, Samuel, and while very proud of the tradition he told us it was both scary and dangerous. During the hours we paddled in between the various villages, Trevor and I had many conversations about the local way of life and how it compared to ours. 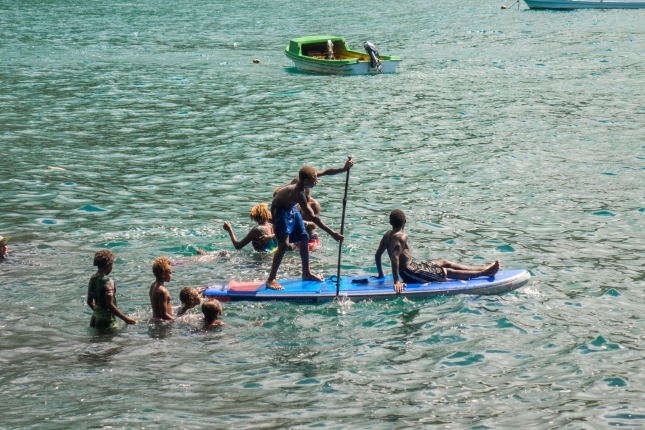 It seemed that people on most islands in Vanuatu, especially the more remote outposts, live in another rhythm. They sit under trees for hours discussing life, love and death. 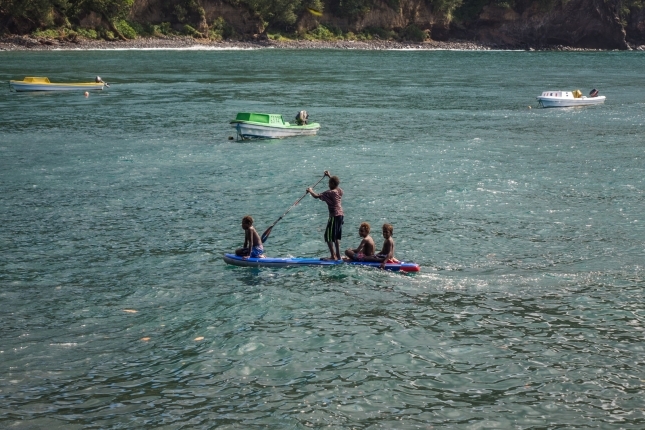 Kids have a lot of time to play–not with toys but simply in the forest and on the water. Our children in the West could learn a lot from them. Yet on these last two islands we witnessed the conflict some villages are facing between tradition and the modern world. There are so many influences from the outside, whether brought by citizens who have traveled abroad to work in Australia or New Zealand and returned with money and mobile phones, or via tourists who can have a similar influence. Even in the most basic villages, where there is no electricity, money or other modern conveniences, we would always see one or two phones. The younger generation all knew what Facebook was even if they weren’t necessarily on it. 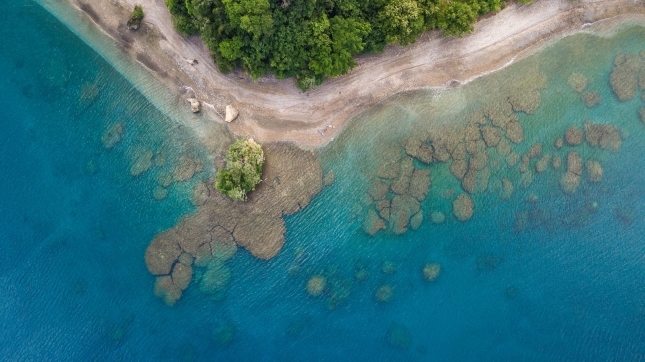 It will be hard to stop Vanuatu from slowly changing and modernising. The Chinese are buying up a lot of land, which many locals are worried about. But while some try to resist this kind of outside influence, many will accept the money being thrown at them and their lives will change dramatically. Whether or not it changes for the better is something that worries me. Our last night was spent close to the “airport”, which was simply a tiny house next to a basic runway that itself acted as a road crossing to the local beach. There are only two flights per week, so walking across the runway was a fairly casual affair. Suddenly we were informed that our flight to the main island was going to be four hours late, which was a slight issue because it was the first of four flights and meant we’d miss every connection back to Hawaii and New Zealand, respectively. Our window of opportunity was only narrowly shut so we didn’t give up hope, but missing that first flight would mean a four-day delay for me and a nightmare of travel rebookings for Trevor. We were slightly worried. Fortunately, Trevor’s mum in Australia called ahead and convinced Air Fiji to delay the next flight as long as they possibly could. 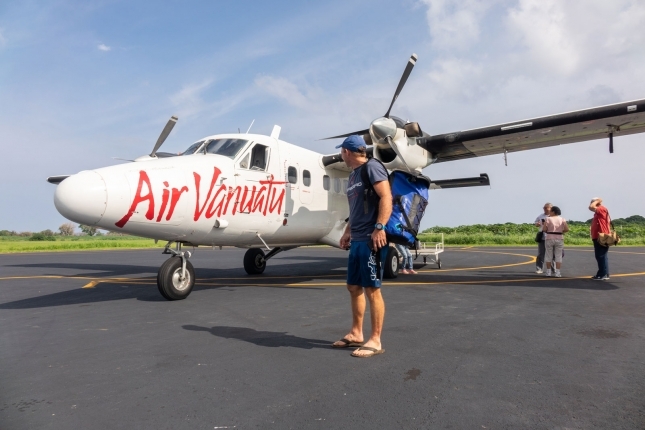 The next morning, when we were due to depart, our small passenger plane was first going to make a crossing to some small, outer islands before returning to collect us. This gave us the chance to chat with the pilots, to whom we explained that we’d be extremely grateful if they could come just a little earlier to help us make our connection. They did just that, adjusting the schedule by a whole 30 minutes to accommodate us. We arrived at the next step five minutes before the departure time of our connecting flight. With a little bit of running and a lot of help from the ground crew, we made it onto our next flight at the very last minute. Quite possibly the shortest connection in the history of aviation! 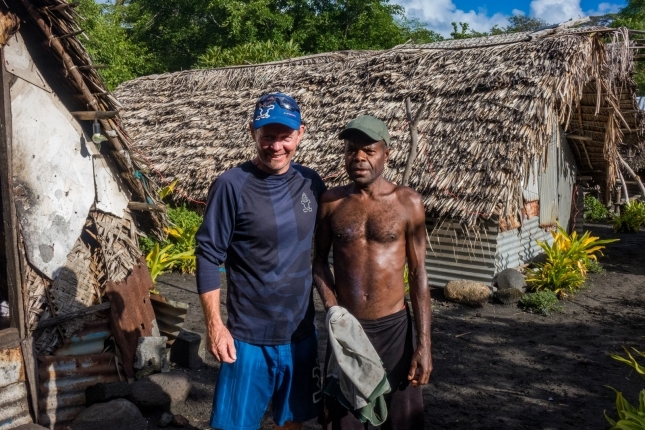 Before Trevor and I went our separate ways at the airport in Fiji, we each concluded that Vanuatu is a very special place. We saw some spectacular sights, but what touched us the most was the people. With no exception, whether they were young or old, chief or fisherman, every single person was friendly, kind and generous despite living a life without many “things” of their own. 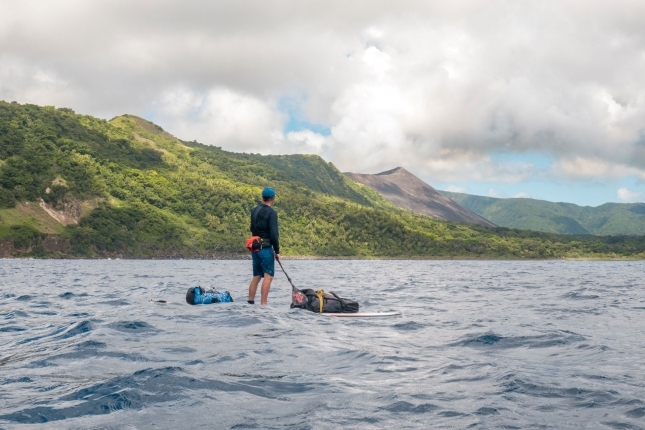 We can all learn a lot from the islanders of Vanuatu, and I encourage you to go on your own adventure somewhere remote in the world with nothing more than an inflatable board and an open mind.